Tile doesn’t just go in your bathroom or on your floor. The more you know about tile, the more you can appreciate how versatile and beautiful it is and how it changes a small stale space into a spacious eclectic living area. Wyeth Woodworking and Remodeling offers the most superior quality materials and tile expertise with custom tile work, indoor tile floors, outdoor patio tile floors and counters, ceramic tile fireplace hearths, kitchen backsplashes and bathroom remodeling. Whether you want to use a natural stone, glass or ceramic tile, the design potential with today’s quality tile products will ensure a lasting beautiful scheme in your kitchen or bathroom. Bring us your ideas, designs and thoughts and work with our tile design and installation experts to create the best color scheme and choose the perfect materials for your tastes. Tile doesn’t just go in your bathroom. 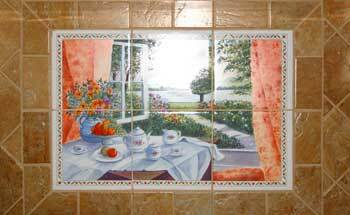 Let Wyeth Woodworking and Remodeling help you beautify your house with tile.